PepsiCo’s four-stage ReCon (resource conservation) program focuses on understanding energy and water use at the plant level and beyond. The first stage of ReCon focuses on understanding resource utilization at the plant level. The ReCon toolkit includes a Water Profiler, which identifies and quantifies major water users and their associated costs. Another component of the toolkit is an online Diagnostic, which determines whether best practices are being followed. The Profiler and Diagnostic are used together to identify and prioritize conservation projects. ReCon Water was introduced at six PepsiCo-owned manufacturing sites and one supply chain partner site in 2009. The savings opportunities identified at those sites totaled over one billion liters of water, corresponding to energy and water savings of nearly $725,000. 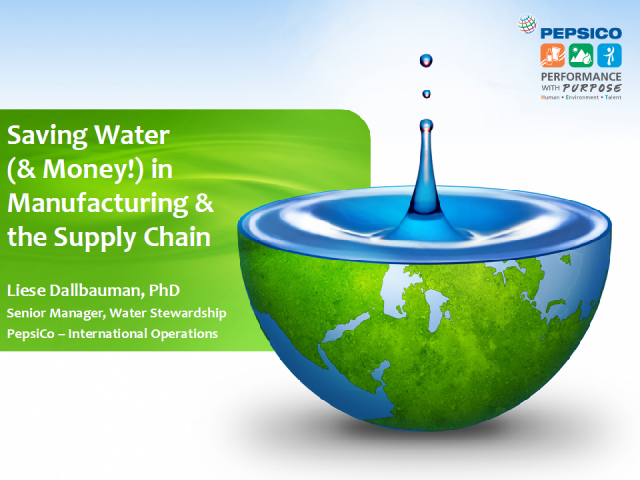 This presentation will describe the ReCon process and the ReCon Water toolkit, as well as examples of the savings found at snack and beverage plants. More than two-thirds of the Bay Area’s water is imported from outside the region. Today these supplies are regularly threatened by drought, earthquakes, water quality impairments and new regulations on availability and usage — risks that will intensify with future climate change. Meanwhile, our region of 7 million people will add 2 million more by 2040. Do we have the water we need to support our projected population growth? And what are the most sustainable and reliable ways to supply our future water needs? SPUR's report Future-Proof Water, presented by Laura Tam, analyzes the Bay Area’s current water supplies and future growth projections, then recommends the best tools for meeting our water needs — both in the near term and through the end of the century. The Governor’s California Water Action Plan (CWAP) released in January 2014 is a five-year plan outlining the ten central actions towards a sustainable water management. In January 2015, California Natural Resources Agency, California EPA and Department of Food and Agriculture released the CWAP Implementation Report, which highlights achievements to date and outlines activities for the next four years. Manucher Alemi will provide an overview of the CWAP and the Proposition 1 to achieve sustainable water management along with DWR’s roles, including expanding water conservation and water use efficiency. Onsite water resources including rainwater catchment and greywater can be used to decrease or eliminate net water demand of commercial and residential developments. Integrated design incorporating smart water-efficient landscape design with water re-use systems result in "Closed Loop Design". New practices such as bringing rainwater into the house for domestic, non-potable use and using grey water to irrigate landscapes with native and drought tolerant plants with innovative irrigation techniques, may be the future of development in California and beyond as water resources become more scarce and unreliable. Ken Baerenklau will present the results of a study conducted at UC Riverside that examined the effects of switching from uniform to budget-based rates in the Eastern Municipal Water District of Southern California. The study utilized ten years of monthly water bills for 12,000 customers in EMWD’s service area to calibrate a household water demand model and then estimate the effects of the budget-based rate structure on water demand after controlling for average price level, weather, and income. The rate structure appears to have reduced demand by 10-15% primarily by causing previously inefficient households to become more efficient. The second presentation, by Tim Barr, Western’s Deputy Director of Water Resources, will outline the Western Municipal Water District implementation of a water budget-based rate structure for its retail water customers. Western’s unique approach uses real-time, microzone-specific, evapotranspiration data and modified monthly turfgrass coefficients from UC research to calculate accurate landscape water budgets on a daily basis. Western’s finance and water efficiency staff collaborated with rate and horticultural consultants to develop a structure that safeguards the financial integrity of the District, provides each unique customer with the water they need, and sends appropriate pricing signals based on efficient water use with every water service bill. In 2015, Western linked the rate structure and the District’s shortage contingency program in anticipation of reduced water supplies due to statewide drought. The Stanford University water conservation project is a collaboration between Stanford and FishNick and it all started at the 2014 Annual PG&E water showcase! The goal of this project is to establish baseline water and energy use for old dishwashers in large kitchens and also to identify operational changes that can easily be implemented to improve efficiency of water and energy use by kitchen staff. In our presentation we will review: elements needed for setting up this project, site selection, and analysis of metering and temperature data from the old and new dishwasher and kitchen processes in a large university kitchen. The data collected by FishNick is used to establish the baseline water and energy use for old inefficient equipment. By reviewing the kitchen operations and understanding staff needs and actions, additional kitchen equipment, maintenance, and efficiency improvements will be implemented. Comparing the water and energy use for the baseline conditions with consumption after the new equipment and processes are in place, helps quantify the potential for water and energy savings and a simple payback for equipment costs. California Bay Area weather is some of the most difficult to predict across the United States due to microclimates and complex topography, yet the National Weather Service and emergency management agencies seldom are required to issue severe weather-related warnings. When moisture deficit is not on everyone’s minds, California weather is like a soldier’s life: 99% boredom and 1% panic. Infrequent so-called ‘atmospheric river’ events are the primary driver behind flooding-related hazards along the central CA coast and Bay Area, and also play a leading role in our state’s water supply. In contrast, during times of water shortage, the forecasting challenges remain while the continual emergency of drought persists over years. The National Weather Service, as part of NOAA, implements a Hydrology Program at a local level for water-related decision support and teams with other local, regional, and national resource agencies to provide information pertaining to both flooding and drought. This presentation will provide an introduction to the National Weather Service: where we’re located, what we do, and how we partner with agencies, the media, and our customer base (local citizens). We’ll also discuss how both flooding and drought are monitored and predicted, and what data and tools are publicly available that may be used as a catalyst for wise green building design that affords hazard resilience. A modicum of discussion on what the future climate portends for Bay Area water balance will also be provided. How actively are California’s green buildings addressing water conservation and management? What can we do to catalyze an even greater focus on the state’s top environmental priority in these buildings? New research reveals insights from 1,300+ LEED-certified buildings in California and offers new approaches to leverage buildings as part of the solution to the current water crisis. Sierra Business Council's Water Energy Nexus Study analyzes the potential to increase energy and water savings by improving the operational efficiency of several small to intermediate sized, Sierra foothill water agencies/districts with a focus on minimizing water losses and improving pumping efficiency. Eileen Kelly, Dig Your Garden Landscape Design, will discuss a variety of landscape design alternatives to replace or minimize the traditional lawn such as no-mow grasses, hardscape materials (gravel, decomposed granite, natural stone, boulders, mulch, and sculpture), and eco-friendly strategies such as “sheet mulching” to quickly eradicate the lawn. For over ten years, East Bay Municipal Utility District has offered rebates for converting ornamental lawn to sustainable landscaping. Hear Michael Hazinski provide a water utility perspective on the trends in consumer acceptance of sustainable landscaping and a comprehensive approach to implementing landscape water conservation incentives. Jodie Sheffield, Sod Development Expert from Delta Bluegrass Company will introduce you to their water saving California Native Sod products. The presentation and discussion will focus on: how to choose the right native sod for your project, water wise irrigation management, and how to maintain native sod. Stormwater professionals have been studying stormwater control measures for decades, and foresters have been studying and growing urban trees for centuries. But the practice of combining the two to use trees as a Stormwater Control Measure is in its infancy. Recent results showing water quality benefits for urban tree/soil systems equal to and surpassing that of many traditional bioretention systems will be presented. As research is rapidly discovering ways to enhance performance of bioretention and urban tree/soil systems, this presentation will also highlight some of the most promising new developments, such as, for example, use of various soil amendments to enhance water quality performance, as well as design strategies to maximize stormwater volume and water quality benefits. This session will showcase the work of two innovative Bay Area design firms and demonstrate water conservation strategies at a range of scales-from broad-level planning and analysis through detailed landscape design and construction. We will look at recently completed projects as case studies for watershed management solutions that are at once beautiful and functional, and provide quantifiable benefits demonstrating water reduction, cost savings, and ecological improvements. Results from original research and prototype testing will be shared. Implementation strategies include stormwater management, plant and material selection, greywater systems, living roofs, water recycling, and irrigation best practices. How does long-term use of greywater affect the soil? Do households reduce water consumption after installing a greywater system? How much maintenance is required? Find out the results of a comprehensive study of 83 greywater systems in California. We monitored the effects of greywater systems on soil, plant health, quality of irrigation water, household water consumption, as well as user satisfaction and maintenance. We will offer recommendations for future system design and installation based on the results of the study. Josiah Cain, Sherwood Design Engineers; Willa Kuh, Affiliated Engineers Inc; Kylie Grubb, Affiliated Engineers Inc. This panel presentation will explore recently-completed work by Affiliated Engineers Inc. and Sherwood Design Engineers with a focus on projects at large institutions including Stanford University and UC Berkeley. Panelists will establish that water use reduction is cost effective even in locations without drought conditions and with moderately priced water and sewer services. Panelists will also prove the viability of water-focused ecodistricts and acknowledge that client commitment to long-term water sustainability, backed by sound economics, can guide future development. Case study examples will include university campus projects, a research building, a hospital and a former Marine Corps Air Station. Many consider the current drought in California the worst since precipitation record keeping began over a hundred years ago. With the federal government declaring 27 California counties as “Natural Disaster Areas”, water districts are in a crisis mode. This panel discussion will include presentations by some of the largest and most progressive water utilities in Northern California: Contra Costa Water District, East Bay Municipal Utility District, Napa County, San Francisco Public Utilities Commission and Zone 7 Water Agency. Each panelist will describe the water supply outlook for their district and outline the key activities they are pursuing to reduce water use. Humans have been concerned over water and water supplies since agriculture and stock raising began some 10,000 years ago. What do we know about about droughts in the past and how did ancient societies handle them? Brian Fagan, an archaeologist, looks at examples from western North America and describes what we know about medieval droughts in California and their relevance to today’s water concerns. In what ways are we more vulnerable than those who lived through California droughts a thousand years ago? What fundamental differences are there between human relationships with water in the past and today? Coordinating water-energy efficiency efforts provide a significant opportunity to achieve greater savings for both water and energy utilities. In particular, jointly run end-use water and energy efficiency programs have a huge potential to save energy and water at the home and at the supply source. Yet, coordinated programs face a number of challenges. In this panel, we will describe some of these challenges and how to overcome them. Panelists will include a researcher, a water specialist who has worked on the “Watts to Water” program and PG&E program managers for agricultural irrigation, clothes washers, and commercial kitchens. This session was conceived as a way to acknowledge the 10th anniversary of the Water Conservation Showcase and will be structured as a panel discussion. The intention of the session is to take a quick look back at the status of water conservation from ten years ago when the first showcase was held, consider some of the most successful conservation efforts that are active today and explore how utilities will address water management in the future. The presentation will focus on current and emerging approaches toward providing water management services and tools to assist water customers in managing their own water use. These tools are applicable to existing customers as well as new development to maximize cost-effective water efficiency benefits. The panelists are from four of the most innovative and ambitious water utilities in California: Julie Ortiz of the San Francisco Public Utilities Commission (SFPUC), Richard Harris of the East Bay Municipal Utility District (EBMUD), Bill McDonald of the Metropolitan Water District, and Chris Dundon of the Contra Costa Water District. Each panelist will provide a brief presentation on their perspective of the past, present and future of water conservation. The bulk of the session will be set aside for what promises to be a lively discussion. This session will focus on the completed projects of two design firms. These case studies will highlight the innovative solutions that both firms deploy in their efforts to reduce fresh water use and waste-water run-off. The panelists are Lisa Petterson of SERA Architects Inc. and Jeffrey Miller of Miller Company Landscape Architects. The specific projects they will present are described below. Each panelist will share how water conservation measures where achieved in their projects, the measured impact of these solutions and lessons-learned that impacted their future work. The session will end with questions from attendees. In 2008, SERA Architects was commissioned to design a high-rise multi-family development to meet the then newly released Living Building Challenge Standard. The team recognized that Net Zero Water would be particularly challenging due to the water needs of a residential building. We applied for a grant to identify regulatory barriers project teams would face when creating Living Buildings. In the undertaking, we found ourselves doing more than just identifying barriers. Ultimately the team’s work resulted in passage of three alternate methods to the state building code and a house bill which legalized the use of rainwater and graywater in Oregon. As a result of these policy changes, the team is celebrating completion of one of the largest rainwater collection projects in Oregon and is now designing what will be one of the largest rainwater-to-potable systems ever built. Miller Company Landscape Architects is an award-winning landscape architecture firm located in San Francisco. Case study projects illustrated in this presentation include over 20 green school yards the firm has designed and built in San Francisco. These projects include independent and public schools commissioned by SFUSD, SFPUC and include edible and native gardens, rainwater catchment systems and educational components. The first portion of the session will be a presentation of the results of a joint ACEEE/AWE Report, Tackling the Nexus: Exemplary Programs that Save Both Energy and Water, which identifies and recognizes the most successful programs that seek both energy and water savings, and chronicles these programs so that others can learn from them. The results of this research include case studies of each award winning programs and an overall synthesis and discussion of the research, including key common characteristics of the best practice programs, recommendations for successful programs, and useful lessons learned. It presents best practice ideas and lessons learned for next-generation customer energy and water efficiency programs, along with concrete examples of successful program implementation. This session will cover the water-energy nexus, the methodology of the report, the winning programs and best practice results and challenges discovered from the research. The second portion of the session will be presented by Joe Castro. Joe is one of the winning program administrators and will present on the details of his program, The City of Boulder Colorado's Energy Performance Contracting Program, including the motivation for creating the program, program design, program performance and lessons learned. The third portion of the session will be presented by Loraine White. Loraine was an expert panelist and helped determine the winning programs that were included in the report described above. Loraine will speak to the water-energy nexus in greater detail and draw on her years of work in this field and expertise. Generating electricity requires significant quantities of water, primarily for cooling. This demand can be particularly challenging at a local level representing in many cases a community’s single largest consumer. In addition, wastewater from these facilities can have a significant impact on water quality within a region as well. Since 2003, the California Energy Commission evaluated new power plant proposals based on policies that encourage the use of degraded water supplies rather than fresh water by power facilities and where feasible, use zero liquid discharge systems to eliminate wastewater impacts. In addition, efforts to significantly increase the efficiency of water used by power facilities as resulted in significant reductions in overall water demand by new facilities as compared to older plants. This course will explore the water dependencies and efficiency opportunities associated with power plants and the policies that now govern this relationship in California. From the beginning, water has been at the center of our lives. We choose to live by it, harness its energy, and certainly depend upon it for sustenance. Historically we collect our stormwater and whisk it away in the most expedient and efficient manner never stopping to consider its ability to make additional contributions. Over the last few decades and with increasing frequency, stormwater has been treated as the important resource it presents. Designers and artists, together with engineers and agencies are looking to celebrate stormwater’s presence in our communities through creative expression, interpretation, and the visible additions of green infrastructure. There are inspiring examples from around the world to motivate us to join efforts with our colleagues and our communities to make an impact and to celebrate water. Water and energy are quickly becoming some of the world’s most valuable and sought after commodities. These webcasts will feature live presentations by scientists, academics, and business leaders addressing the increasingly important issue of energy and water management. For businesses, efficiency will cut costs and promote environmental awareness, and for all, this summit will provide insight into best practices, tips, case studies, and solutions for responsible resource and facility management.